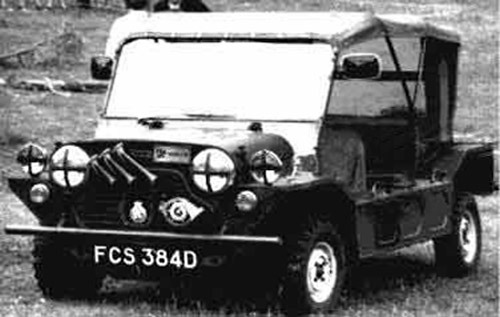 For me it all began with Dodo, a min Moke, in the late 1960's my dad went to Glasgow to buy a car, it was either a Fiat 127 or a Land Rover, then he saw Dodo, a Mini Moke, glittering in the sunshine. I learned to drive in Dodo and passed my driving test in Dodo. I do not think the examiner could believe his eyes when he saw us. It was one of those cold, wet and windy days in Girvan, down in the Southwest of Scotland. The roof was up and the sides on, but the rain still came in. By the end of the hour the poor man was shell shocked, he certainly did not want to repeat the experience, so I passed. 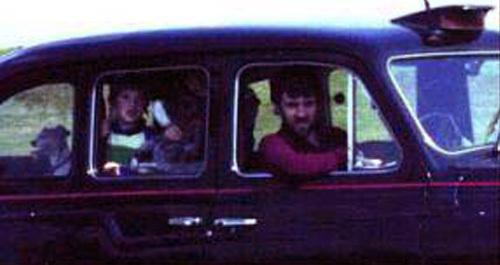 Dodo at a scout camp in Oban, Scotland, 1970. Dodo's lights illuminated the site, allowing us to erect the tents. Eventually I adopted Dodo and we went everywhere together, Occasionally I was allowed to drive the 18 miles to Maybole, where I went to school. Many a time, on an early winters morning, while it was still dark, I observed vehicles, coming towards me, with close together head lights, these were either tractors or Land Rovers, no other vehicles counted. Dodo accompanied me to College, way down south, in Carlisle and then onto Sunderland. We had many happy, carefree years together but eventually the day came when we had to part. This awful event occurred in the summer of '73 in Birmingham, it was a very painful parting and I often wonder how Dodo got on and what eventually happened to her, or if she is still driving around somewhere. 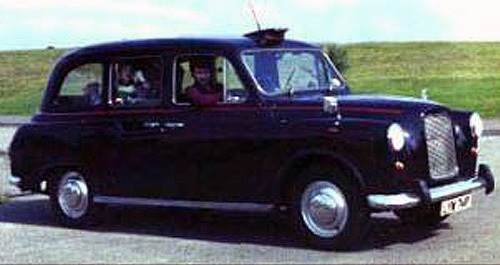 Around 15 years ago I bought a RAT ( a Really Advanced Taxi) well it wasn't really, it was a very basic, slow, ex-London taxi, a 3.1. It was great fun, big, very roomy, had a brilliant turning circle and I loved it. You can just see Matthew and possibly Kirsty in the back with Emma our dog, they all loved this limo. 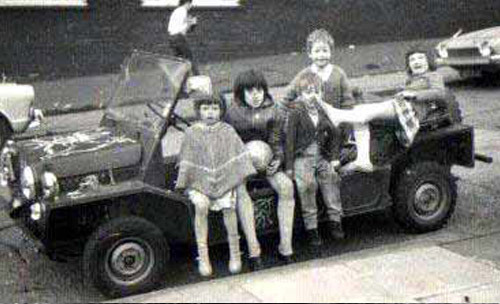 It was an ideal vehicle for a young family, prams, push chairs, boxes of nappies, toys, even bikes, went straight in the back with no problem at all and of course, when Emma, the dog, Kirsty and Matthew got too noisy, I could close the window between us. We remained together for a number of years and many was the time my wife was asked by her pupils, at school, why she went everywhere in a taxi. Eventually our taxi had to go. One night, on our way home, we stopped at some traffic lights in Ilkeston, Derbyshire, two lads got in beside Rosie and demanded that I take them to Derby. And if that was not bad enough the next night, a cold, wet and windy night, the taxi returned home on the back of a low loader, flashing yellow lights announcing our arrival to one and all. My next real vehicle harked back to Dodo, it was a development from Dodo but was big and, relatively, roomy like our taxi. Unlike my dad, when I saw the big red shed with four wheel drive, I bought it. The big red brick was Gromet our Series III Land Rover.